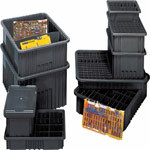 Choose from our Conductive Containers for your electronic components or our Standard Containers for small parts. 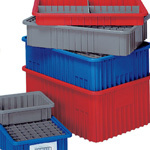 Optional Dividers: Divide your storage tote by length and /or width allowing for subdivisions down to 1-1/8" square compartments. Optional Snap on Covers can protect contents from dirt, dust and damage. Option Clear Label Holders fit any size container. 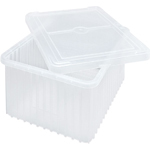 This container over the most efficient method to compartmentalized and protect small to medium size parts. Standard Dividable Totes Available in 4 colors. Conductive Totes are Black.